Fisher Paykel Parts: Genuine Parts for Fisher Paykel Appliances. We are the Authorized Dealer of Genuine Parts for Fisher Paykel Appliances.Need a Factory part for a Fisher Paykel Dishwasher, Washer, Dryer, Range, Stove, Oven, Grill, Refrigerator ? We stock thousands of Fisher Paykel parts and ship them all over the United States. Order online or call 336-464-0093 for help. Looking for a Fisher Paykel washer part? LetsTalkParts.com is your one stop shop for Fisher Paykel washer parts. Looking for a Fisher Paykel dryer part? 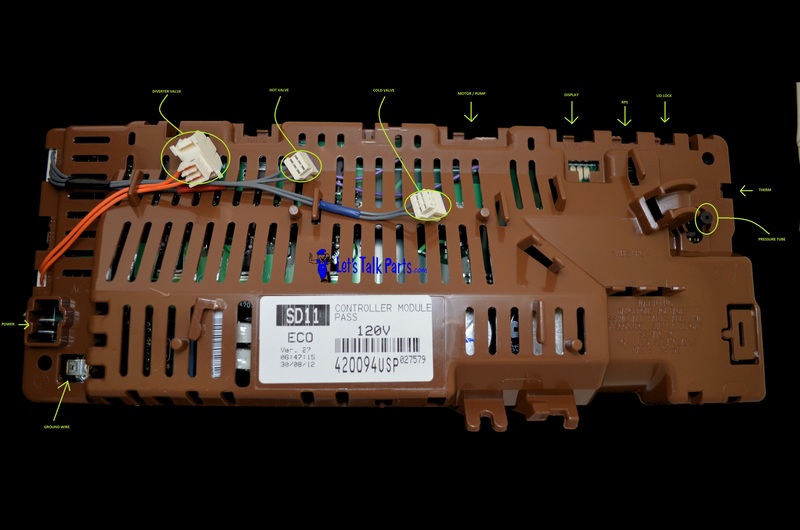 LetsTalkParts.com is your one stop shop for Fisher Paykel dryer parts. Looking for a Fisher Paykel dishwasher part? LetsTalkParts.com is your one stop shop for Fisher Paykel dishwasher parts. Looking for a Fisher Paykel water filter? LetsTalkParts.com is your one stop shop for Fisher Paykel water filters. Common for the fins to break off or crack. Fits most all Fisher Paykel washers with this style of agitator. Drain pump and Fuse kit 420325P / 479595 for Fisher & Paykel washer. Fits models beginning with GWL11, GWL15, IWL12, IWL15, WA37 and WA42. No tools required to replace pump. SELNI 00236NR. Not compatible with GWL10 and IWL09 (which use pump 420324P) New style part is now issued, see images. Original pump style has been replaced by manufacture! Comes with new updated fuse kit and instructions on how to install. Diverter Valve for Fisher Paykel washers. Fits model # GWL10, GWL11, GWL15, IWL12, WA37T26 series. Pair of lid actuators for the bottom dishwasher drawer. Pair of lid actuators for top dishwasher drawer. *Also will work for part # 8194076 on a KitchenAid Dishwasher. Fisher Paykel dishawasher cup rack, fits in back left position. Fisher Paykel dishwasher cup rack, fits in front left position. Fisher Paykel dishawasher cup rack, fits in Back Right position. Fisher Paykel dishawasher cup rack, fits in Front Right position. Rotor assy for Fisher & Paykel dishwasher models DD605 & DS605. 525489 Part no longer available. part # 511417 is current replacement. Silverware basket for Fisher Paykel dishwasher models DD605, DS605 and DD24 series. Replacement lint screen for Fisher & Paykel topload dryers. Drum bearing kit for all Fisher Paykel top load dryers. Fits toward the right side of the drum. Upper front drum bearing for Fisher Paykel front load dryers. WE49X20697 is the part # for the dryer bearing maintenance kit if needing more than on part. This controller is different in appearance from the old design. This will fit these models though. ALSO INCLUDES NEW INLINE FUSE FOR BOARD PROTECTION..
Click here for IMAGE to help with installation of control module. Fisher Paykel Parts: Genuine Parts for Fisher Paykel Appliances. We are the Authorized Dealer of Genuine Parts for Fisher Paykel Appliances. Need a Factory part for a Fisher Paykel Dishwasher, Washer, Dryer, Range, Stove, Oven, Grill, Refrigerator ? We stock thousands of Fisher Paykel parts and ship them all over the United States. Order online or call 336-464-0093 for help.